Bowling Green is back in the national rankings. But the Falcons are striving to keep their recognition in perspective. They’re ranked 19th by U.S. College Hockey Online, the first time since the 2007-08 season they’re in the Top 20. BG is 7-2-1 overall entering this weekend’s home-and-home series with Ohio State. The teams play Friday night at 8:07 in the Ice Arena and Saturday night at 7 in Columbus. “It shows the program is moving in the right direction,” BG sophomore forward Matt Pohlkamp said of the ranking. “It doesn’t mean anything on the ice, but it’s nice recognition for the program. The Falcons are off to their best 10-game start since the 2004-05 season when they were 6-3-1. 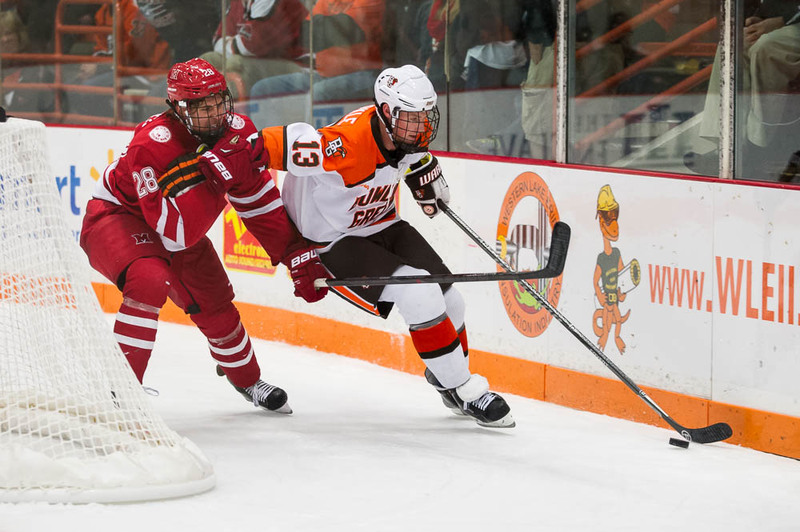 BG is coming off a 3-2, 3-2 sweep last weekend at Alaska (Fairbanks) to run its winning streak to three games and its Western Collegiate Hockey Association record to 5-1. “I don’t pay much attention to the polls when we’re in the poll as a Top 20 team, and I don’t pay much attention to the polls when we’re … outside the Top 20,” Bergeron said. GOALIES: Bergeron said no decision has been made on who will start in goal against OSU, although sophomore Tommy Burke has been sharp the last three games. Burke has a 1.67 goals-against average and a .964 save percentage in those three games. The Falcons rotated their three goalies during the first four weekends. The Alaska series marked the first time the same goalie started both games. “It really wasn’t a plan,” Bergeron said of why Burke started both nights in Alaska. Bergeron explained Burke started the first game at Alaska because of how well he played in the team’s previous game. Burke had 26 saves in a 3-1 win over No. 12 Minnesota State in the Ice Arena. Burke then played well in the first game of the Alaska series with 26 saves in a 3-2 win, earning the start in the second game. In the series finale, he stopped 36 shots to help BG to another 3-2 victory. CLUTCH: Burke and Yale’s Alex Lyon are the only two goalies in the country to have started a game and not allowed a goal in the third period and overtime this season. Forty-nine of Burke’s 139 saves have come in the third period and overtime. FINISHERS: The Falcons are closing out games in the third period this season after losing a number of leads during the final 20 minutes last season. This season, BG is 5-0 when leading after two periods and 2-0-1 when it is tied after two periods. They’re also 4-1 in one-goal games. The Falcons have outscored their opponents by a 9-4 margin in the third period this season. At Alaska, the Falcons were tied 2-2 after the second period Friday and held a 3-2 lead after two periods Saturday. 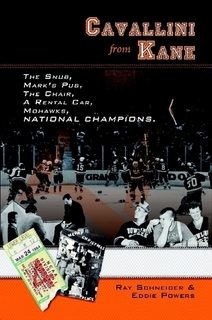 “A sweep in college hockey is the difference between good and very good,” Bergeron of the Alaska series. “There are a lot of splits going on, and sweeping is hard, especially in somebody’s else’s building. TATE: BG could see junior forward Brent Tate return to the lineup this weekend, but no decision has made. He has missed the last five games after reinjuring his groin Oct. 24 at Clarkson. He first hurt the groin in BG’s season opener against Miami Oct. 10. One of BG’s most valuable players, he has played in just two games. He adds skill and a physical presence, and skates on the power-play and penalty-killing units. After facing OSU, the Falcons have just two more series before Jan. 1 — Nov. 21-22 at home against Bemidji State and Dec. 5-6 at Northern Michigan. “There’s lots of discussion,” Bergeron said. “The bottom line is we’re a better team with Brent Tate in the lineup. That mind-set has to be long-term. It can’t be this Friday. It has to be long-term, meaning we want him playing in February and not dealing with this issue because of a game on November 14 or 15. KUCERA: Bergeron said senior defenseman Connor Kucera is “progressing nicely” after injuring his shoulder Oct. 17 at Alabama-Huntsville. He has missed the last seven games. “He’s practicing in a red jersey (no contact),” Bergeron said. “Today (Wednesday), he did everything. I was really encouraged to see him involved the way he was. SERIES: The Falcons are 90-68-3 all-time against OSU, but the teams split a home-and-home series last season. Each team won at home last season. BG is 34-40-3 at OSU.